When Chappie was released in the U.S., it was a R-rated film. But for the movie’s upcoming Japanese release, Sony decided to edit the film for kids 12 years-old and up. Here’s where things get really awkward. Since Sony Pictures Japan isn’t disclosing the edits and since the movie hasn’t opened in Japan yet, it’s impossible to say how the film was censored. ParentPreviews.com has a list of the movie’s adult content, so you can draw your own conclusions as to what has been toned down for Japan. Upset, fans contacted Blomkamp via Twitter, telling them that they didn’t want to see a censored version of the movie in Japan. Blomkamp, however, seems to be hearing about these cuts for the first time. 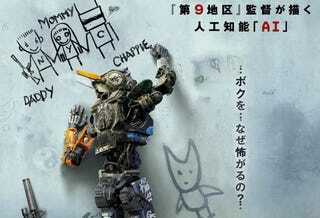 Chappie will open in Japan on May 23. As Sony Pictures stated in its release, there are no plans currently for the movie’s original version to be released in Japan.